Since I revived the Random Gems series last summer after a three year hiatus, I’ve been a lot more proactive in setting aside images that suited its remit whenever they’ve shown up whilst I’ve been editing other sets. If you’re not familiar with it, the series takes those isolated images that don’t fit in with the context of the post at large, groups them together and releases them as a set of their own, using the theory of safety in numbers. This assortment are from all over the place, as far as the south of France and as long ago as last September (to give a idea as to how often I’ve been picking out these images as I’m working). In fact, the one from last September and the one from the south of France are not only both the same image, but also the one with which I’m going to open this post: this shot of a lovely old car in a car park on the Côte d’Azur. Next up, a shot from around Christmastime, when I was first playing about with the 50mm f/1.4 I’d hired to test. Whilst assisting in childcare after a visit to Santa we found ourselves at a food hall using party whistles to keep the kids occupied. Inevitably things got a bit messy, but gave me the opportunity to play about with a big aperture with a bit of a colourful scene, one which is a bit of a twist on the usual coffeeshop images you see. Still playing about with the 50mm f/1.4, I took a photo of a tipped plant pot outside our window. The other piece of equipment I borrowed over Christmas was a ND filter to get some long daytime exposures. Most of these were taken on a walk in London, but I also returned to one of the first places I tried this sort of photography, Twickenham riverside, and recreated one of the first shots I’d tried there. The shot above is the longest exposure I’ve ever done, at seven and a half minutes. I needed several goes to capture it too – on one shot, a seagull perched on top of the post for just long enough to be a pale ghost. On a couple of others an email pinged on my phone, which apparently interrupts Triggertrap, the software I use to time the exposure and keep the shutter open. Whilst there, I also took a shot of some of the pigeons that had been keeping me company. After I’d bought my own 50mm f/1.4, I took it on a night walk in London. I got pretty great results with it, but one shot was so abstract I set it aside to show off here. Whilst playing about at home with the lens, I took this random shot of a spoon in a hot drink. 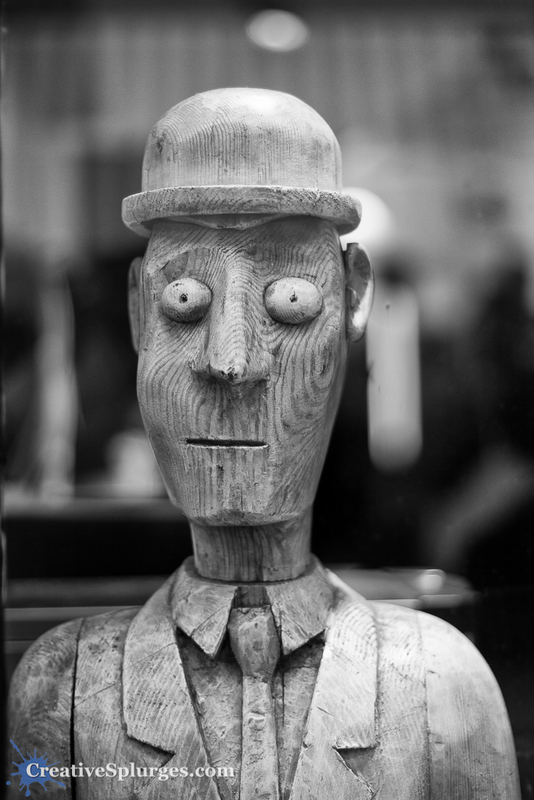 When out in London with some family we visited a coffee house, who had a wooden statue in the window, which was definitely worth getting a photograph of. Shortly after the coffeeshop, we made our way to a pub in Covent Garden, one with a whole load of crazy crap on the walls. The last shot in this assortment is one from last week’s post. Wandering around Chinatown I came across this statue of Charlie Chaplin opposite the Prince Charles Cinema. Although West End Wander was a bit of a grab bag of images, this one still seemed to stand out on its own from the others, so to me it makes sense to be here in this set. That’s it for now; as I’m editing sets I continue to pick out shots as that don’t quite fit with the others, and from time to time I also find random shots in my archive that are worth sharing too. When I’ve amassed what seems like a respectable number I’ll put out another set of random gems. Nice shots, man! I just got back in Detroit this Monday, so I gotta play catch-up on my photos and blogs.